Excitement builds as you drive through the popular My Mountain Community. Scenic vistas, beautifully framed by Mother Nature, are revealed at every turn, and as you wind along the paved roads, anticipation builds for what lies ahead. CloudWalker delivers on its name. Offering peace and tranquility, CloudWalker is the last cabin on the ridge at the end of a quiet road. It's not uncommon to awake in the morning to a blanket of clouds, which slowly recedes unveiling a view of the Blue Ridge Mountains that will take your breath away. It's an irresistible invitation to linger a while and watch the world wake up. The valley below is home to a quaint farm, and with your next cup of coffee, you'll catch the cows being let out into the paddock for the day, while the deer graze nearby. This beautiful retreat has as much to offer inside as out! CloudWalker's decor celebrates a love for the outdoors with antler accents, wildlife art, and rustic fixtures. An elk mount above the wood burning fireplace provides the signature touch of a mountain lodge. The large family room with adjoining kitchen and dining area are perfect for entertaining — gather together to watch the football game or choose a movie from the extensive DVD library and curl up under a throw. The well-stocked kitchen is sure to please even the most discerning host, with custom wood cabinets, ceramic cook top oven, and stainless cookware. Whether you're preparing an intimate dinner, a family-style meal, or a winning tailgate spread, you'll find all the necessary culinary essentials. And if the cook wants to take the night off, there are a multitude of wonderful restaurants just 15 minutes away in downtown Blue Ridge. Downstairs, CloudWalker's second family room offers hours of fun for kids of all ages. Watch a thriller on the 50" flat screen with BluRay DVD, play video games on the Sony PlayStation 3, test your skill at pinball, or choose one of the many board games for some old fashioned fun. If you get hungry, you won't have to go far -- just grab a snack and a drink from the mini kitchen! The loft is equally suited for rest and play with a twin-over-double bunk bed, as well as a billiards table and reading library. It's the perfect place to curl up on the chaise futon and get lost in a good book. Day or night, kids will feel like it's their own private getaway. If you look forward to entertaining outdoors, there's ample room for everyone on the cabin's two levels of wraparound decks. 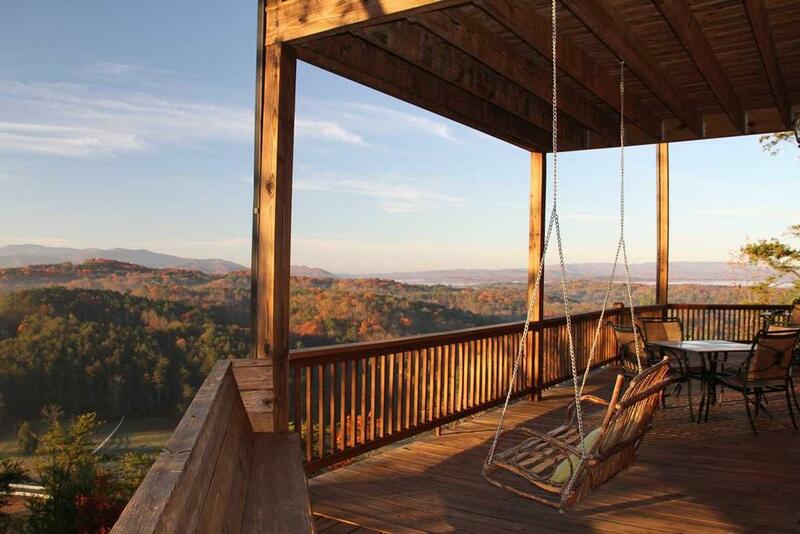 Relax on any one of 3 double swings and watch the sunset with a glass of wine, or if your day was spent fishing on the Toccoa, fire up the gas grill and serve your catch while dining under the stars. As night falls on the ridge, warm up by the fire pit where stories are told and laughter flows freely. Afterwards, you might decide to head to the screened-in porch and toast the day's adventures with a nightcap while relaxing in the hot tub and enjoying the fire. This spacious cabin offers three, perfectly appointed king master suites -- each on a different floor for added privacy — and is perfectly suited for three couples or for families enjoying a weekend getaway together. Each bedroom boasts its own flat screen TV, gas fireplace, ceiling fan, and wonderfully oversized bathroom with double vanity. Families with young children will love the upstairs master. Little ones can snuggle up on the full futon for a bedtime story or watch a movie on BluRay in the morning if mom and dad need to squeeze in another hour of shut-eye. Couples will relish the privacy and solitude of the sitting porch located off the upstairs master. Not to be outdone though, the other two masters open out to a deck as well. Everyone has a front row seat to the "morning show" that makes this cabin so special. CloudWalker is a place to reconnect -- with friends, with family, with self. You'll leave refreshed and rejuvenated and already planning your next visit. With all of its luxury amenities and offerings, a stay at this beautifully appointed cabin will have everyone walking on clouds. 03/19 - We enjoyed the quiet remoteness of this cabin. The bigness allowed us to have three close families sharing the space yet have our own master bedrooms. Super grateful for the help finding a relaxing space for our families. 08/18 - We loved the grill, the fire pit outside, the pool table, very spacious house with great appliances, the view and porch. Great company, everyone was very friendly and helpful. 07/18 - Bright and spacious home in a great location. I've rented several times from Escape to Blue Ridge and every time they've been great and the homes are always exceptional. 07/18 - Our cabin was spacious, clean and comfortable but the outstanding feature was the view. My 12 year old grandson's first comment on arrival was “wow, it was worth the twelve hour drive”! I found Escape to Blue Ridge to be “top notch” in friendly customer service with accurate portrayal of the property I had rented. The kids ranging from 6 months to 19 yrs old kept busy playing pool.. walking trails.. the 6 month old loved staring at the ceiling fans. Very pleasant company to work with to plan a vacation with 3 different families. 3/18 - We enjoyed the views from each level, fireplaces inside each bedroom, both living areas, the outside porch, and the fire pit. We had 12 people and there was plenty of room. We have utilized Escape to Blue Ridge now 4 times and absolutely love them. 2/18 - We wanted a great view, and definitely got it with this home! We have used Escape to Blue Ridge since we started renting cabins in north Georgia and are very pleased with the company. The customer service has always been respectful and courteous and booking is very easy. 2/18 - The cabin was awesome. The roads to the cabin were easy access and great. Loved the 3 king bedrooms with fireplaces and tvs and balcony access. Loved the wood burning fireplace in the den. Love booking with escape to blue ridge. 08/17- Exceeded our expectations. Very well equipped. Just lovely. Very easy rental process. Great to deal with. 07/17- The pinball machine was great entertainment. Great service. 06/17- The view was exactly what we needed to sit back and enjoy our time away. My husband was thrilled with the pinball machine and pool table along with the wood burning fireplace. It was the perfect spot to feel secluded but not far away from town. From booking the reservation to having issues with the key pad when arriving at the property the people we worked with went out of their way to ensure everything was resolved quickly with a manner that made us feel like old friends. 04/17- We loved absolutely everything about the cabin! The company is easy to work with. 01/17- The well-supplied kitchen was perfect. The kids loved the downstairs man cave. Of course, the view was spectacular. Great experience, once again! Everything was perfect from the location to the cleanliness. The booking process was easy! 01/17- Our favorite feature of this home was the large bedrooms. 12/16- There is something in the cabin for everyone. From the pool table and pinball machine to the view that is so amazing. Very helpful and professional. Thank you. 10/16- Gorgeous home, gorgeous view!! Your company was a pleasure to deal with. Thank you for your professionalism as well as your friendliness. 10/16- The panoramic views from the decks were spectacular. Great times were spent around the fire pit in the evenings. The pin ball game was great fun....Yo ho, Yo ho a pirates life for me ! Reclining chairs were very comfortable, as was the bed we used on the third level. We have rented from your company several times and have been quite pleased with the service ! 09/16- We enjoyed the views, comfort and solitude. The staff are efficient and professional. 07/16- love the set up! don\'t like all the stairs to get into the home. 07/16- Great view, very relaxing, and love the amenities. 06/16- Gorgeous cabin. Perfect for gathering of families and friends. Spacious rooms. Had everything we needed in the kitchen for our cooking and baking needs. Enjoyed the fire pit, hot tub and game room. We didn't have to leave the cabin. 06/16- I have stayed at many cabins in the Blue Ridge but Cloud Walker by far is the best. The view is outstanding. I liked how there are 3 king beds so picking room wasn't difficult. It is a beautiful cabin and I cannot wait to rent it again. I have been renting cabins in the Blue Ridge for about 3 years now. I have only rented from Escape to Blue Ridge company. They are very nice and extremely helpful in assisting you. Plus, all the cabins have been beautiful! 05/16- The view was the best thing about the home! We also liked the 3 master bedrooms. 05/16- The home is beautiful, the furnishings and beds extremely comfortable. Kitchen outfitted very well for preparing meals. Views amazing! 04/16- The home was absolutely breathtaking!!!!! The view from this cabin is unreal!! 02/16- Excellent location, fabulous view, layout of spacious cabin, cleanliness, awesome beds and linens. A pleasure to communicate with! 02/16- Awesome view and the snow was great! 12/15- The home had enough room to accommodate our family very comfortably. My husband and I were very pleased with the service we received, would recommend to our friends and family. Can't wait to book another trip!! 11/15- The view was very pretty, just as we expected it to be from pics online. The bed in the main floor bedroom and upstairs bedroom were very comfortable, we slept great every night! The hot tub was wonderful, we enjoyed that every day, some days more than once! We were very comfortable in the downstairs media room, the furniture was nice and the TV was great! 10/15- The cabin itself was nice. In line with what we have experienced from other rentals in the area at this price point. 09/15- The roominess of this cabin and the view. 08/15- The view is absolutely breathtaking. The cabin is extremely spacious with lots of special touches. The beds are so comfortable. I highly recommend this cabin! It seems good. I never spoke to a human, so I don't know about that side of it. I was impressed with the fact you professionally launder the sheets instead of just washing them in the cabin. 07/15- The kitchen was well stocked, it was very clean, even the beds were super comfy! 06/15- Plenty of swings and outdoor seating for family. Outdoor fireplace and fireplace in each bedroom. King suites on each level. Hot tub was nice. This was our second time to rent a cabin with your company and we will continue to use you. Very polite, helpful, and professional. Directions to cabin are always PERFECT. Easy to talk to on the phone. Reservation is simple process. 05/15- The view, peacefulness and all the amenities of the cabin. 04/15- The view was beautiful, the cabin it self was beautiful, very clean. Lot's of games and televisions. Very relaxing time. Very friendly, efficient and informative. Reservations went off with no issue! I will be back to Cloud Walker!!! 03/15- The view for sure. Love the three separate bedrooms with bathrooms. All the fireplaces and fire pit. 03/15- All the fireplaces!! Great cabin and great customer service. Had to call about the fireplaces not lighting and someone came out within the hour! Cabin was gorgeous, spacious, and clean. Will definitely be back. 03/15- The view (and all the balcony space! ), the wood-burning fireplace, the big/clean jacuzzi.Wonderful... concise helpful communication, not too little, not too much, but juuuuust right ;) And the cabin was very clean! 02/15- Very roomy and great bedrooms and baths. Everything we needed was here. I just use this company. We have always had great experiences with Escape to Blue Ridge! 01/15- The Walk around deck, the wonderfully large bathrooms & bedrooms, the fireplaces everywhere. The view was incredible. 11/14- Everything was incredible!!!! The view was amazing and the house was very comfortable!!! 10/14- The view. The fire pit. The hot tub. Awesome experience. 10/14- The outdoor fireplace,...the cabin amenities were 1st class, bathrooms, bedrooms...you could tell that the owners take pride. Loved the basement tv and pin ball awesome. We have rented from others and you by far have the most 1st class and updated cabins. We had questions in how yo turn the outdoor fireplace on and called not long after check in...your concierge....I believe Greg....came out and was very gracious.....we will definitely rent this cabin again. 09/14- Very open, great views, clean, 3 separate living areas, great deck space. 08/14- The screened in Jacuzzi, the pinball machine, the floor plan and the amazing view were all incredible and our favorite features. Excellent management company. Thank you to the team for finding us the right cabin for our needs (not on steep roads to get to the cabin). This is our 3rd time renting with you and will continue to do so next year and recommend to others. 08/14- Favorite features were the bathrooms, kitchen and decks. Blue ridge is beautiful and so is Cloud Walker. The eight of us had a wonderful time. We couldn't have asked for a better weekend. Cabin was not cleaned well. Oven very dirty, cobwebs between windows and screens, grill had to be cleaned before using, inside of washer dirty.\r\nCabin needs maintenance.\r\n1/2 of jets in hot tub didn\'t work, temperature in hot tub couldn\'t be turned up, batteries in the remotes for TV, etc. were out and new ones were not provided, blinds in top floor bedroom were broken, drawer in refrigerator was broken, top of clothes dryer gets real hot and dryer takes a long time to dry clothes (clean the vent?? ), should spray for insects.\r\nGood points: linens were great and plentiful, beds were comfortable, dishes, pots, pans adequate, view great, lots of great relaxing areas, men enjoyed pinball. Cloudwalker was an excellent place to stay and enjoy the views. Every morning was greeted with the clouds that revealed the nice farm below. The drive to the cabin revealed nature at its best. Every morning and evening was greeted with deer's and bunts on the road side. The cabin was nicely equipped and kept our kids busy. The cabin is great with the three master suites the provide great privacy for all the families that visited. I would love to go back if the opportunity presents in the future. The only down fall was the slight gravel drive for the cabin. The agency did a great job getting us ready to stay there. The cabin was ready and the book of activities help fill our days. They were responsive to emails. I did not have any problems. Cloud Walker is an Outstanding cabin! Amenities were all there!rnWe were blessed with great friends and perfect weather to go along with this great property!